“Four score and seven years ago our fathers brought forth – the Internet!” Okay Abraham Lincoln never said that. But he can today. Just ask his avatar. 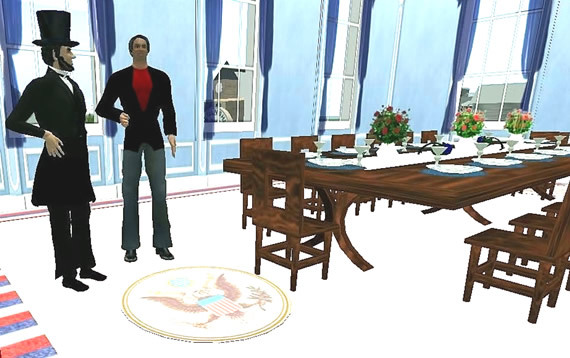 Honest Abe is alive again in Land of Lincoln; Second Life’s sim of artifacts, documents and displays reflecting his life and turbulent presidency. Don’t call it a museum. “This is an immersive historical experience,” said sim and center manager, Daisyblue Hefferman, correcting me on my poor description. Far from a stale-static display of dusty old stuff, this place is “alive.” Hold on to your top hat Mr. Lincoln, virtual museums are springing up faster then your Gettysburg Address (and that’s here too). Logistics: Travel costs are easy. There aren’t any. The public: No worries. Crowd control is a non-event. No crying babies, obnoxious custodians, or crowded elevators with sneezing germ spreaders. Thanks to the diligent work of Linden Labs, there has been not a single case of SL swine flu. But cyber advantages go well beyond the above. In the Land of Lincoln, there is a cemetery – the final resting place of Civil War solders. Click a headstone, and photographs, art work and text give a ‘grave’ account of who lays there. Like the information box, soon the interred will pop up too – avatars in period dress, discussing Civil War life and death. It’s not everyday one speaks to a ghost solder. Just ask President Lincoln; he’s been known to walk here too. Lincoln frequently speaks in his namesake’s land, even holding press conferences. One day I will tell my grandchildren how I met our 16th president in Cyberland. He wore a top hat, beard and black coat. I was in pajamas. Turn the corner and visit slave homes. With a mouse click, we read their books. In the background is Washington D.C.’s Lincoln Memorial. Now, that’s strange. I just saw Lincoln and here’s his memorial statue? Time and space mean nothing in S.L. Perfect for a virtual museum. “We can do things here that are impossible real world,” noted Daisyblue. “You don’t just look at artifacts; you actually handle them. We not only see the moving parts; we take them apart to examine them more closely.” Try asking the guard at the Smithsonian Institute if you can handle the Hope Diamond. See what he says. And that’s the idea: come back for more. Second Life has hundreds of museums – not just historical centers, but venues devoted to science, art, nature and most anything else. More are coming. Thank you Mr. Lincoln, I was there today. Good seeing you. Emmett Burnett, AKA CompE Lockwood in Second Life, is a freelance writer based in Mobile, Alabama with hundreds of published articles in over a dozen newspapers and magazines. He has also served fulltime as a sports editor, city desk reporter, and feature writer. His bi-weekly newspaper column, “So There,” can be accessed at www.eburnett.com. Daisyblue is an inspiration for all historians, librarians, and history buffs for bringing history to life like no one else in history has been able to do. Thank you Daisy, Lori Bell, Director of Innovation for the Alliance Library System and all the volunteers that make Land of Lincoln possible.